The Following Expalnation of the Service is written by Rev. Alkiviadis Calivas, and can be found in his book entitled, "Great Week and Pascha in the Greek Orthodox Church." 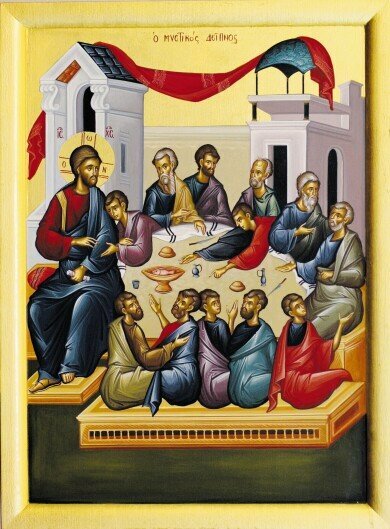 On Good Friday evening the Orthodox Church celebrates the Orthros Service for Holy and Great Saturday. Come, let us see our Life lying in the tomb, that He may give life to those that in their tombs lie dead. Come, let us look today on the Son of Judah as He sleeps, and with the prophet let us cry aloud to Him: Thou hast lain down, Thou hast slept as a lion; who shall awaken Thee, O King? But of Thine own free will do Thou rise up, who willingly dost give Thyself for us. O Lord, glory to Thee. Today a tomb holds Him who holds the creation in the hollow of His hand; a stone covers Him who covered the heavens with glory. Life sleeps and hell trembles, and Adam is set free from his bonds. Glory to Thy dispensation, whereby Thou hast accomplished all things, granting us an eternal Sabbath, Thy most holy Resurrection from the dead. On Great Saturday our focus is on the Tomb of Christ. This is no ordinary grave. It is not a place of corruption, decay and defeat. It is life-giving a source of power, victory and liberation. Weep not for me, O Mother, beholding in the sepulcher the Son whom thou hast conceived without seed in thy womb. For I shall rise and shall be glorified, and as God I shall exalt in everlasting glory those who magnify thee with faith and love. "By mine own will the earth covers me, O Mother, but the gatekeepers of hell tremble as they see me, clothed in the blood-stained garment of vengeance: for on the Cross as God have I struck down mine enemies, and I shall rise again and magnify thee." "Let creation rejoice exceedingly, let all those born on earth be glad: for hell, the enemy, has been despoiled. Ye women, come to meet with sweet spices: for I am delivering Adam and Eve with all their offspring, and on the third day I shall rise again." Great Saturday is the day of the pre-eminent rest. Christ observes a Sabbath rest in the tomb. His rest, however, is not inactivity but the fulfillment of the divine will and plan for the salvation of humankind and the cosmos. He who brought all things into being, makes all things new. The recreation of the world has been accomplished once and for all. Through His incarnation, life and death Christ has filled all things with Himself. He has opened a path for all flesh to the resurrection from the dead, since it was not possible that the author of life would be dominated by corruption. Moses the great mystically prefigured this present day, saying: "And God blessed the seventh day." For this is the blessed Sabbath, this is the day of rest, on which the only-begotten Son of God rested from all His works. Suffering death in accordance with the plan of salvation, He kept the Sabbath in the flesh; and returning once again to what He was, through His Resurrection He has granted us eternal life, for He alone is good and loves mankind. The Encomia or Praises are short poetic verses lamenting the passion, death and burial of Christ. They are also chanted on Holy Friday evening.